Increase your self confidence & restore the funtion and beauty of your smile by replacing broken or missing teeth! Replacing Your Teeth Can Help You Regain Your Smile and Confidence! Do you have missing teeth and struggle with finding your confidence on a daily basis? Having a missing tooth or teeth can be devastating to one’s self-esteem. But not only does it affect the appearance of your smile, but it can also do more damage to the rest of your teeth if not corrected. At All-In-One Dental Innovations we understand the importance of having a full set of teeth. We know that tooth loss can happen to anyone at any age, but that doesn’t mean you have to continue through life unhappy with your smile. We use innovative techniques, state of the art equipment, and a full range of options to give patients a smile they not only want but that they deserve. Are you ready to take the first step in getting your smile back? We are here to help! Missing a single tooth can often be just as bad to some as missing many or all of their teeth. For those that are missing one of the front teeth, that are more noticeable, this can be especially true. While a back molar missing might not seem horribly upsetting, because you might be the only one to know, there are good reasons why you should replace the missing tooth. Having a gap, no matter where it is located can cause teeth to shift. This can throw off the alignment of your teeth, that could require correction later on. Having a gap in your teeth can also make it difficult to eat, and cause speech difficulties. When teeth on either side of the missing tooth are still present, and in relatively healthy shape, a bridge can be used to fill the gap. One of the reasons, this isn’t ideal for some is that your healthy teeth will be shaved down to affix the bridge. Because bridges aren’t removable, they need to have the best support possible with the teeth on either side. 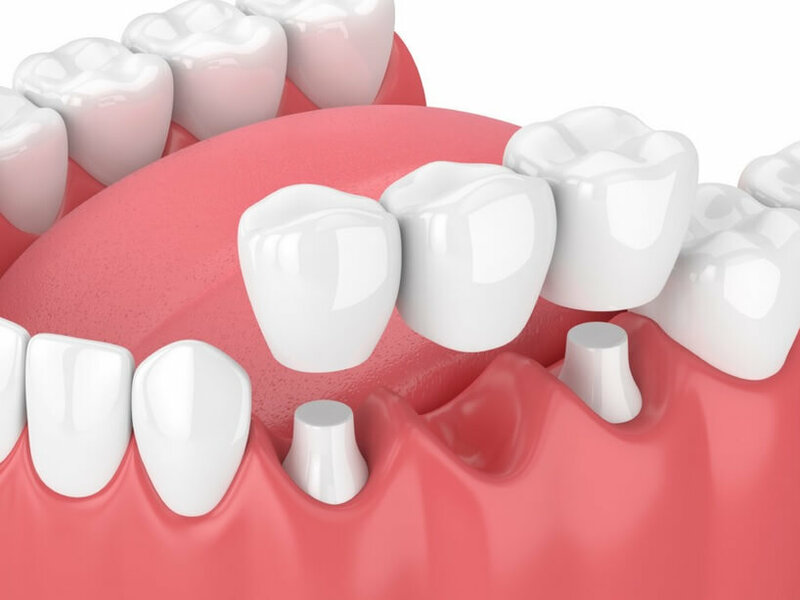 However, if the remaining teeth are in poor condition and need to be filled, a bridge to replace the missing teeth can essentially fix both problems. A removable partial denture is typically worn during the day. A patient will insert the denture in the morning and take it out in the evening. It is secured by metal clasps to the adjoining teeth. This is an excellent option for rear teeth and can be used on the front. However, when used on the front teeth, others may notice the metal clasps. 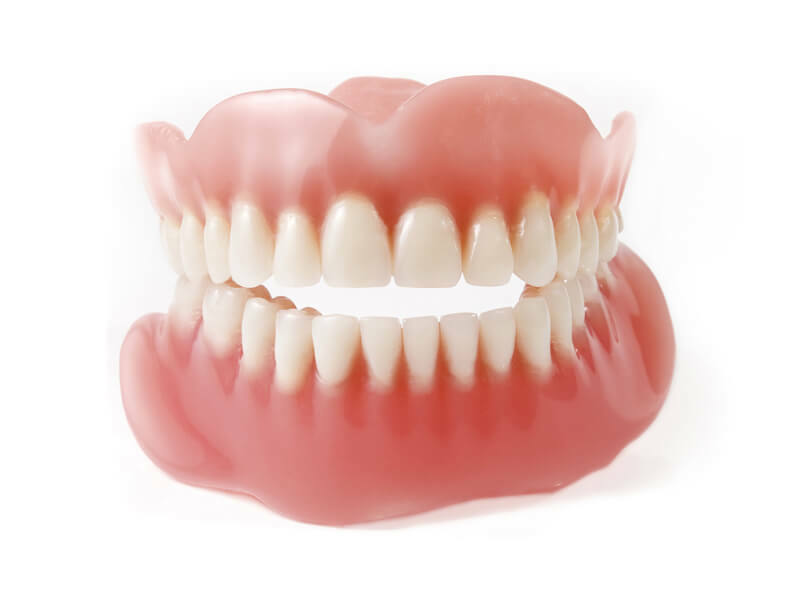 A partial denture may also move when talking or eating, and can sometimes make the wearer feel self-conscious and aware that they have a denture. 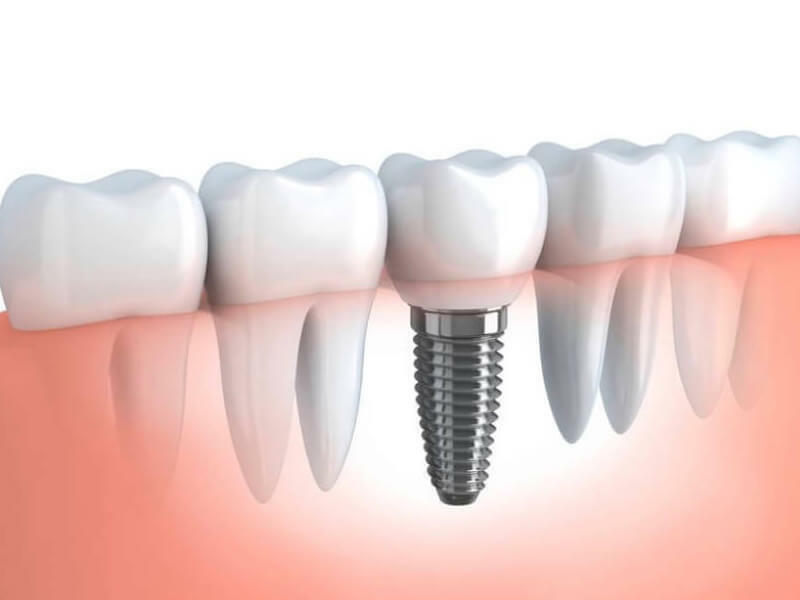 For those that want the most natural looking and most comfortable solutions to an individual missing tooth, dental implants with a single crown are ideal. Your dentist will surgically place the implant post into the jawbone and attach a crown to the abutment. The crown will be made to look similar to your existing teeth, matching the size shape, and color necessary for the optimal blending. A dental implant will take up to six months to fully heal and fuse with the jawbone. At All-In-One Dental Innovations we offer same day dental implants. These allow patients to walk out the same day with a full smile. A temporary crown can be used until the permanent one is ready. Missing multiple teeth can feel like a challenge when wanting to restore your smile. But at All-In-One Dental Innovations we offer solutions to fix your smile, no matter if you have two or three or more missing teeth. Our wide range of options will work for virtually any patient with any circumstance. When you have multiple missing teeth, some of the same options can be used as with individual teeth replacements. Below are some of the most common ways, we can improve the appearance and function of your smile. Similar to how we would replace one missing tooth, a bridge can be used to replace multiple teeth in a row. Generally this method will be used for one to two missing teeth but can be used if enough support is available. 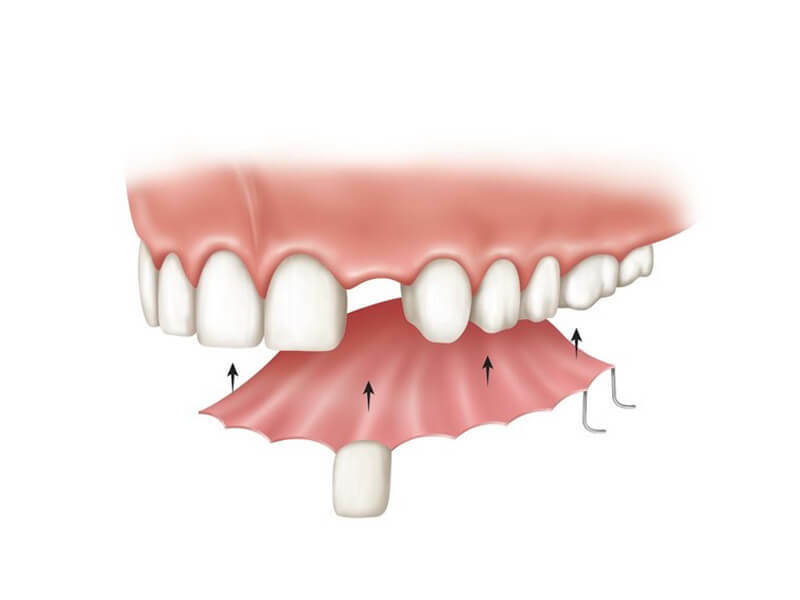 A partial denture can be used to replace multiple teeth with different locations in the arch. These are removable, and as such don’t offer the same feeling of security that other methods may produce. 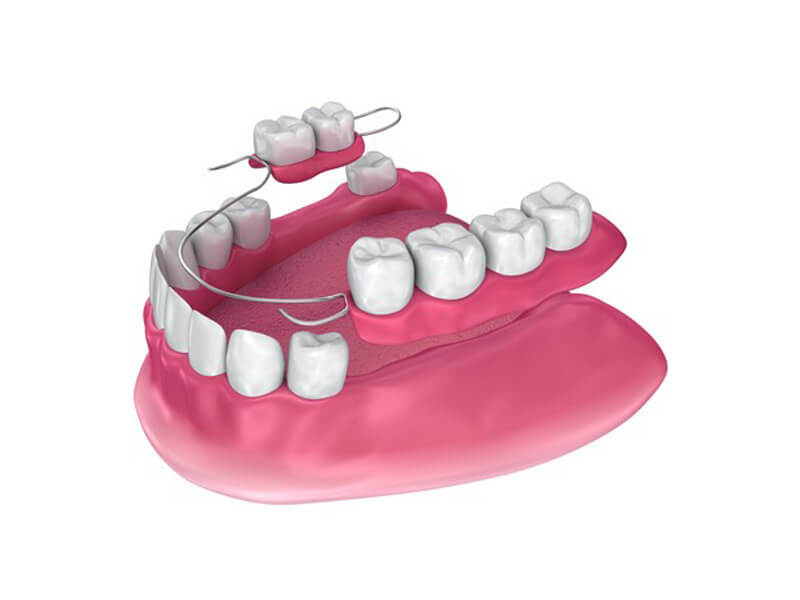 A partial denture will use clasps to connect to the other teeth for support. Partial dentures aren’t considered permanent, because there will be changes in the jaw bone, which will require a new denture to be made for a perfect fit. Patient’s can expect a partial denture to last 7-10 years. 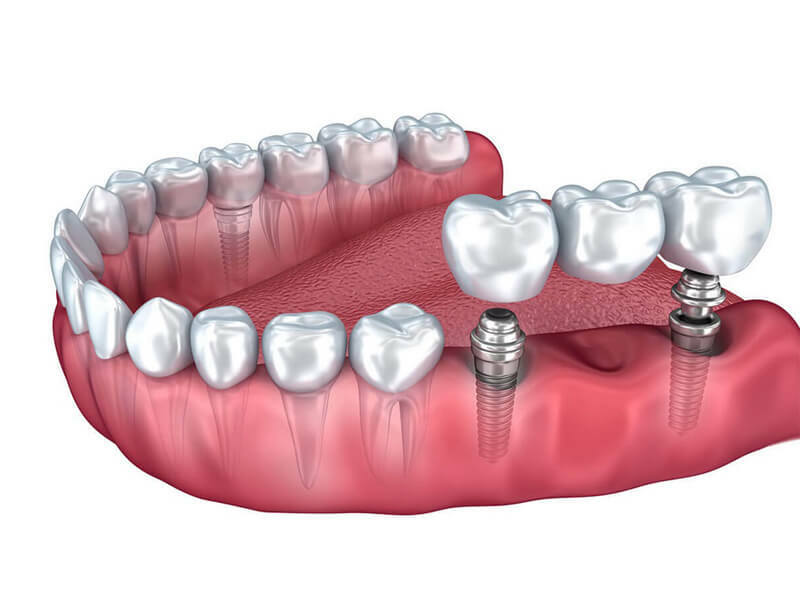 The gold standard in the dental field for replacing a full set of teeth is with dental implants. They are a permanent solution to missing as well as more natural looking versus traditional dentures. 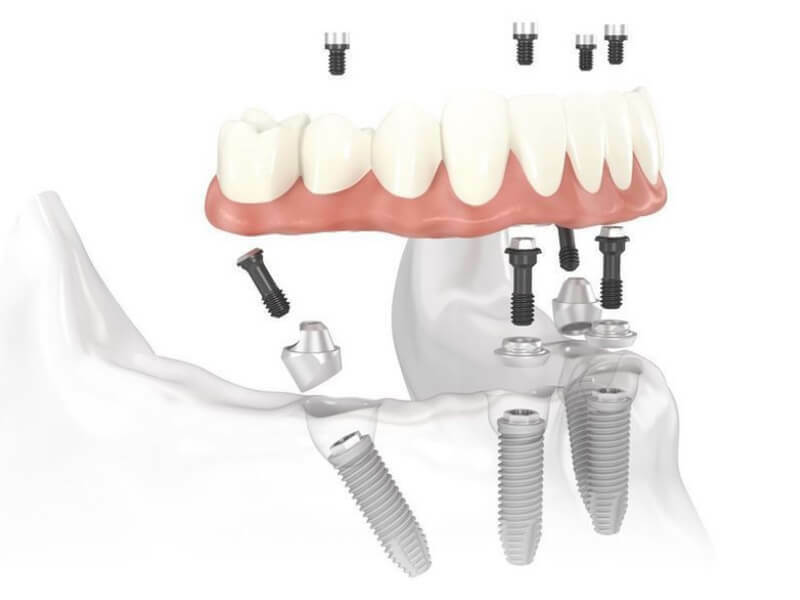 Similar to an implant supported denture, four implants will be used in conjunction with a specially made denture that will attach to the implants. Because they use the jawbone for support, they are very sturdy. Many patients enjoy not worrying they will fall out and the ability to eat most of the foods they enjoy. Dentures are the most commonly used method for replacing all the teeth in a single arch or for a full set. They are the most inexpensive solution and will complete your smile. Dentures are removable and will need to be inserted with an adhesive directly to the gumline. This can be uncomfortable for some patients at first but generally get used to the feeling over time. The major drawbacks to dentures are that overtime they contribute to bone loss. This can make it challenging to get implants later on, without the use of additional procedures like bone grafts. 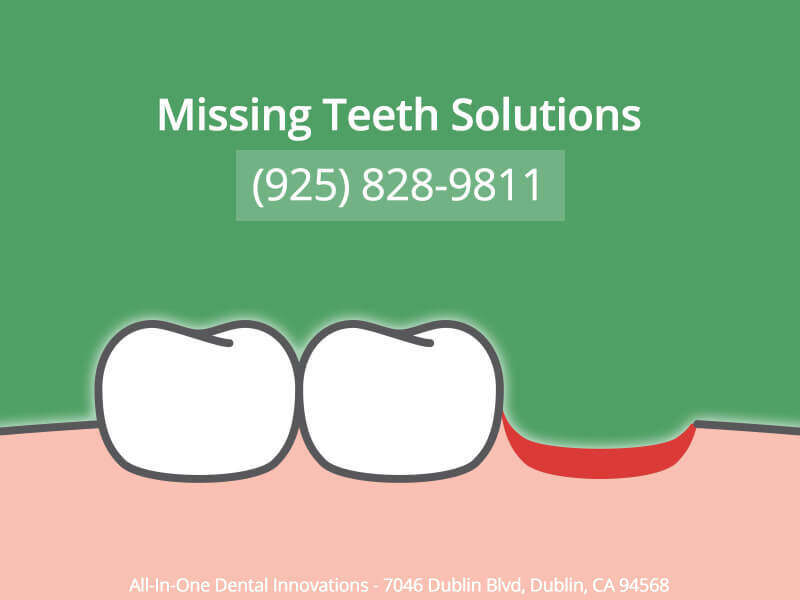 Don’t Let Your Missing Teeth Be a Problem Any Longer! Contact Us Today To Restore Your Smile! We are pleased that you have chosen us as your Dublin, CA dentist for smile restoration! The journey to a beautiful, complete smile, starts by contacting our office to schedule a consultation. Offering the best solutions for replacing missing teeth, we are confident, we can give you a smile you deserve. Don’t go another day dissatisfied with your smile; we can help! Give us a call at (925) 828-9811. Or use our convenient request an appointment online feature, any time!